Picture this. An area more than double the size of Maldives has been burning for six consecutive days. 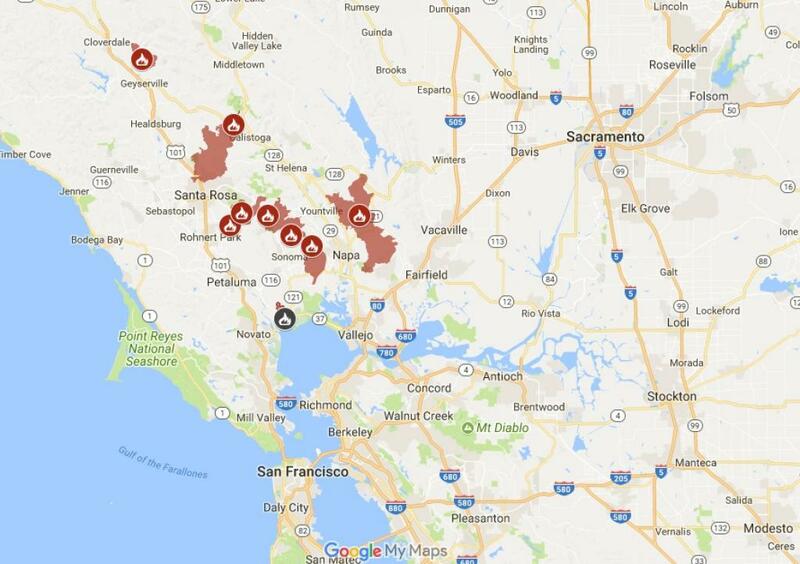 Large swathes of northern California, the Golden State, are now shrouded in ashes as they witnessed one of the deadliest cases of wildfires, killing at least 38 people, destroying 190,000 acres of land and completely ravaging more than 3,000 homes across Sonoma and Napa County. The death toll now exceeds that of the 1933 Griffith Park fire in Los Angeles—one of the deadliest wildfire incidents in California’s history. ‘Diablo’ wind—the hot and dry offshore wind that blows from the northeast California during spring and autumn— is believed to have fanned the fires at a frantic pace. On the evening of October 8, when the fire was first reported, the winds were gusting at a speed of up to 70 miles per hour (110 km/h). Devastation of one of the biggest fires in California. Just like wildfire, these winds (similar to Santa Ana wind in Southern California) are a legacy that California lives with. Diablo is formed when cold air from high-pressure areas in Nevada and the Great Basin warms as it moves toward the coast where lower atmospheric pressure prevails. The wind also loses humidity in the process. It is this hot and dry wind that turns even small blazes into devastating ‘firestorms’. This state in the west coast is no stranger to wildfire, with May to October being the wildfire season when windy conditions and low humidity act as dry fuels for forest fires. However, there are few factors that have made the latest event overwhelming. California has been already reeling under six consecutive droughts since 2011. It had seen below average rainfall in the last 10 of the 11 seasons before 2016. While heavier than normal rain last winter created overgrown forests, the dry spell turned green bushes and trees into tinder. The prevailing dry conditions have sucked in the moisture from plants, leaving behind dead branches and logs. Moreover, record high temperatures had made forests bone dry, an ideal condition for fires to spread. For example, Sonoma County, which sustained the most damage, recorded temperatures around 109 °F (42.7°C), with the town of Sonoma sweltering at 115°F (46°C) just weeks before the incident. Even downtown San Francisco, which is lot closer to the sea, experienced heat wave with mercury touching 106 °F (41°C). The city was never this hot in almost 150 years of record keeping. This emerging trend of a long spell of drought and a very wet winter points to the increasing extreme weather conditions—a direct consequence of decades of carbon emissions. A part of the blame should also go to the state for allowing more and more buildings in hilly areas adjacent to brush and woodlands. Currently, the city of Napa has the most polluted air in the country, according to the Environmental Protection Agency. Its air quality index has been hovering between 160 and 170 for the past few days, while zero to 50 is considered good air quality. Napa is followed by cities such as Oakland and San Francisco that reported bad air quality. Going by the media reports, the smoke from the wildfires has travelled about 100 miles from the fire zones. In the midst of all this, the irony has not escaped people’ attention. The state, which is facing the double whammy of floods and wildfires, is probably the most proactive state when it comes to taking climate action. Despite the climate denial discourse being predominant in Washington, this western state is becoming a model for other states by taking decisive steps on energy and other factors exacerbating climate change. In fact, only few days after the fire broke out last Sunday, Governor Brown established a wood smoke reduction programme to help people of California make the transition to cleaner and healthier heating. What we must all do to slow the devastating effects of climate change is to greatly reduce carbon emissions, because they "fuel the fire" in every sense of the word. Not only are catastrophic disasters striking more often, due to carbon emissions, but burning wood for food, fuel and "fun" is increasingly popular, relentlessly spewing carbon soot into our air, hastening climate change. Isn't it time to consider all wood smoke another "diablo"? Because it's not just hot and dry "diablo" winds that explode forest fires into greater infernos, but all the collective soot in our atmosphere that we must reduce as quickly as possible to prolong the survival of our planet and our lives. For the facts, see www.woodsmokepollution.org. Thank you for your comment Julie. You are right. Wood smoke is an albatross that's been around for long enough to get rid of it. One of the causes of the extreme destruction in California is that the climate there is naturally dry this time of year. That, coupled with a wetter than usual last winter and spring, dried out the much greater grass and shrub growth and made conditions ripe for spreading fires. Then came the hot, dry winds of Autumn and any ignition source triggered a blaze that was off and running. Because of population growth, homes have been built on land that used to be covered with brush which burned naturally every 5 to 10 years and up into the oak covered hills where fires used to burn out all of the brush and keep the woods clear. People, suppressing the natural fires, allowed fuels to build up where they used to be low. The 7 year drought that was ended by last year and this year's winter rains, had killed a lot of those trees and brush and they were standing fuel for the fires to spread among the homes. Because there are more people in the area than the natural water supply can support, cities restrict watering of landscape plants and those become dried out as well. Climate change would have little effect if it were not for the great concentration of people on land that should not have been used for homes. Thank you for your comment Allen. I must admit that I was not aware about water rationing and restricted watering of landscape. Thanks for bringing that to my knowledge. The fire is nothing to do with climate change. It is so happened that live power wire fell on the ground that sparked the fire. With dry winds this spread over the large area. Without that the wildfire would have not taken place. Pollution is a different issue wherein the survey conducted by a US university showed Air Pollution within the top ten. Higher temperatures are due to urban heat-island effect. I saw a news report on Sacramento in 1998 map of urban temperature regime [I was in San Francisco suburb on that day of June 30]. SWest 9acramento -- 106.0 oF; Sacramento River -- 65.5 oF; Railyard -- 115.7 oF; Midtown -- 97.5 oF; Golf Course -- 92.5 oF. 1. Live wire: Whatever little I gathered from my readings and interactions with few people out there, the extremely high temperatures are robbing tress of their moisture and they have now become bone dry, thus, helping in flaring up the fire. 2. Pollution: The pollution that I wrote about is a direct fallout of large scale burning over a long period of time, leading to a sudden spike in air pollution level. Fires--all kinds of wood and other biomass-burning fires--are a direct cause of climate change. Not only do they spew carbon soot into the atmosphere, which accelerates the melting of glaciers and heats up the ocean, but we are ignoring recreational wood burning, which is the equivalent to mini forest tires every day and night when you add them up across the globe. No one wants to think we can do anything to slow climate change if it means changing our own burning habits. And this is part of the real tragedy. Wood smoke is hazardous to man, bird and beast. For the facts, see www.woodsmokepollution.org and familiesforcleanair.org.